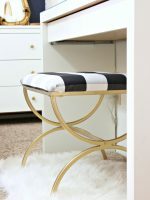 This BEST tutorial on how to paint a dresser quickly and efficiently! 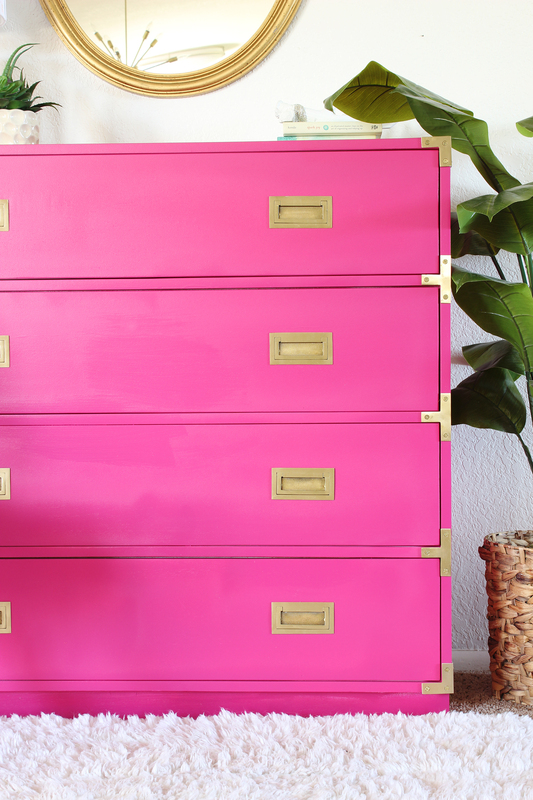 This amazing Hot Pink Painted Campaign Dresser Makeover is so fun! Today’s tutorial is how to paint a dresser. we will show you how to finish one of their raw wood pieces, the Harper Campaign Dresser. Ave Home has a line of furniture called, AVE Raw which is their line of unfinished furniture. This line was created for the DIYer (thats us!!!) or designer who wants high quality pieces with their own custom finishes. Isn’t that amazing!?!? How cool is that!? This gorgeous campaign dresser arrived at my house ready to finish! It was complete primed and ready to paint! 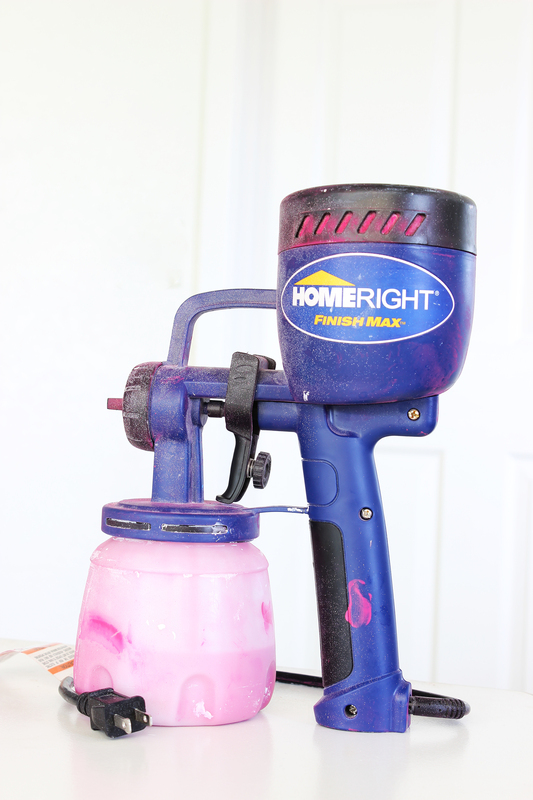 Paint Sprayer – this is our FAVORITE!!! 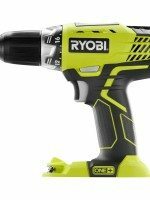 First, use your screwdriver or drill to remove the hardware. Place in a sandwich bag to make sure you don’t lose anything. Next, time to paint! 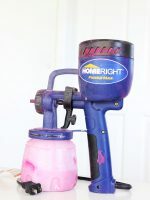 All you have to do is pour the paint right in the basin at the bottom and twist it back on, plug your sprayer into an extension cord and pull the trigger. PRO TIP: You can see our full video on spraying this dresser here. We sprayed the entire dresser in under 10 minutes for the first coat and about 5-7 minutes for the second coat. Once your paint is fully cured, you can you the same spray gun (after you clean it, obviously!) 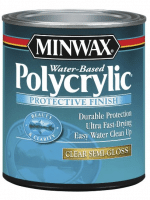 to spray on a finishing coat of polycrylic. When the poly is totally dry, you can reattach your hardware and obsess of your dresser makeover. It’s a show stopper for sure! 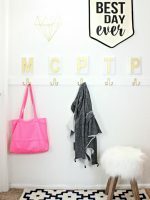 When were at Snap Conference recently a couple of girls coined the phrase “Classy Clutter Pink” and if there ever was a thing, this is it! 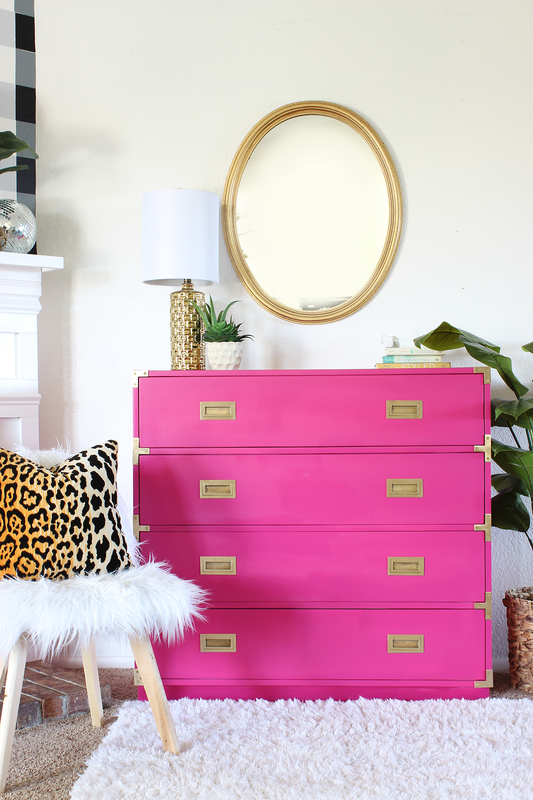 We’re truly obsessed with how it turned out and it was the easiest makeover ever. 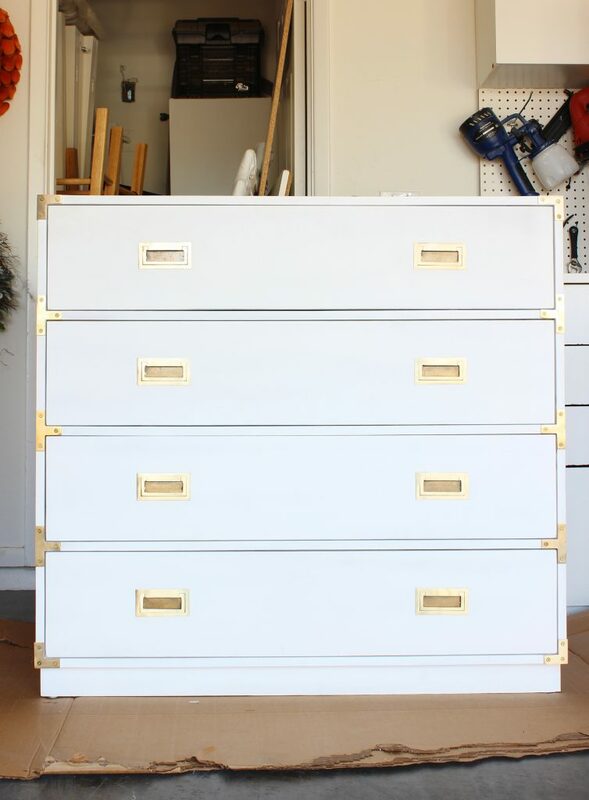 If you’ve ever wanted to learn how to paint a dresser, use this tutorial and tag us on Instagram (@classyclutter) and use the hashtag #classycluttermademedoit so we can see your new dresser makeover! 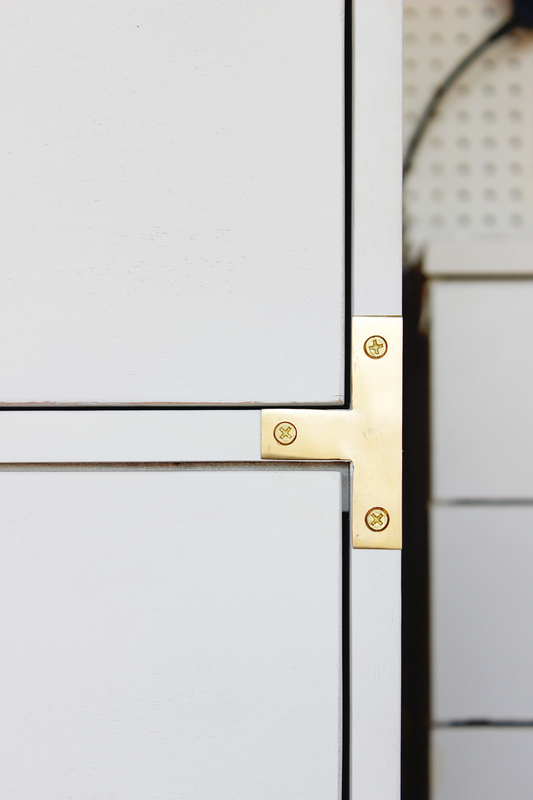 That color is so pretty and it looks beautiful with the gold/brass hardware! Thanks so much! We love how it turned out! Thanks for stopping by! When your closet at SNAP is full of it, I fully agree that there is such thing as “Classy Clutter Pink”!!! We actually made it! We’ll share the tutorial soon! Thanks for reading our blog! Hugs!!! Could I ask what brand/color pink you used? It’s the perfect shade I have been searching for! 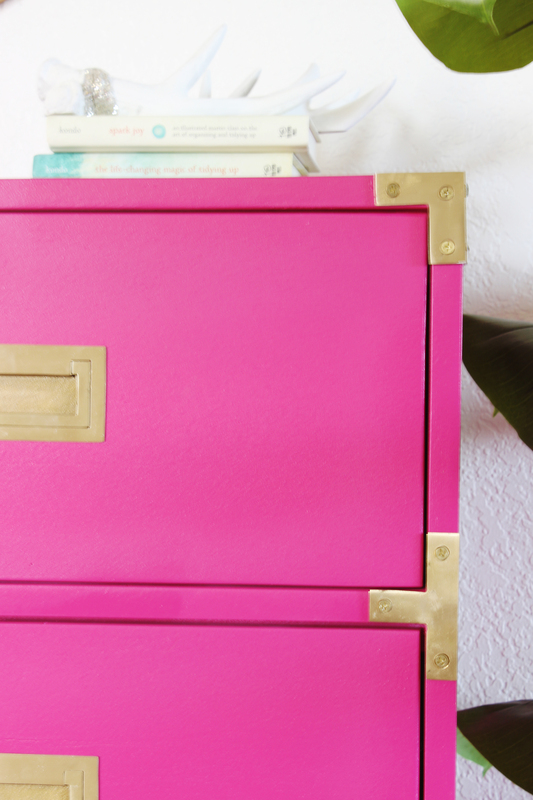 Gorgeous pop of color with the gold hardware. how much overspray is there? can i do it in the yard or would i have a pink fence? DUDE! I LOVE THIS PINK!!! this is so friggin gorgeous now I am gonna HAVE to do this!